The U.N. Peace Keeping Force in Cyprus (UNFICYP) was created by the U.N. Security Council in 1964 in an effort to prevent outbreaks of fighting between the Greek and Turkish communities in the island republic founded four years earlier. It has been in existence ever since. On 15 July 1974 a decade of relative peace on the island was broken when the country's national guard led by Greek officers staged a coup against the Government of Archbishop Makarios and Turkish troops landed in the Kyrenia area a few days later. On 20 July the Security Council called for a cease-fire and has reiterated the call in subsequent resolutions but fighting between the two communities and their allies has continued. Representatives of Greece, Turkey and the United Kingdom, the three guarantor powers of Cyprus's 1960 Constitution, meeting in Geneva late in July and early in August, failed to arrive at a formula for peace in the island. Military representatives of the three powers are working closely with UNFICYP on the island in an effort to establish cease-fire demarcation lines. UNFICYP is at present attempting to limit further hostilities and cease-fire violations, and has mounted a relief operation for destitute Greek and Turkish Cypriots. The total present strength of UNFICYP is over three thousand men from Austria, Canada, Denmark, Finland, Ireland, Sweden and the United Kingdom. 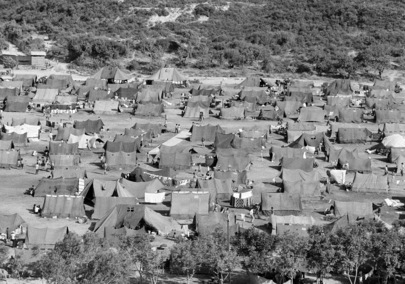 The tent village "Happy Valley" set up by the ICRC and British forces in Episkopy, S.B.A., to provide shelter for Turkish Cypriot refugees.